As we review honors curricula we sometimes encounter so many options that we find it difficult to emerge with a clear impression of the requirements. The curriculum for the University of New Hampshire Honors College is that rare combination of clarity and flexibility that can be readily understood. 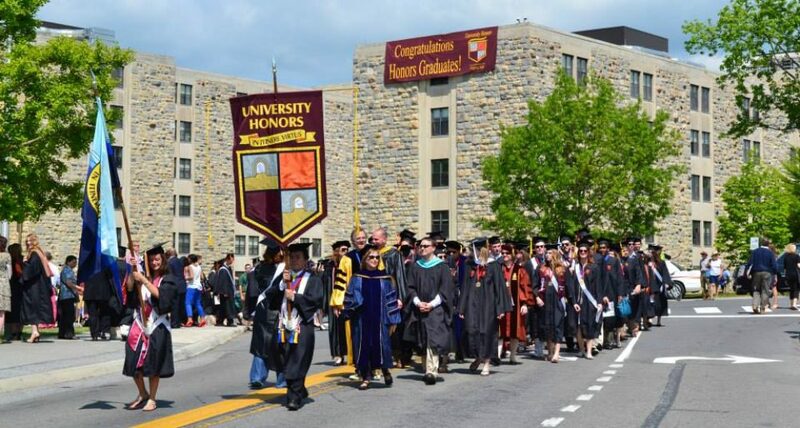 Moreover, the curriculum is extensive, requiring 32 hours of honors credits for graduation if students pursue the University Honors Designation. This option includes 16 hours of honors seminars, usually limited to 20 students, which also count toward general education requirements. Then students go on to complete another 16 hours in Honors in Major courses, including at least 4 hours of which are the honors thesis. This kind of clear integration between honors general education requirements and departmental specialization, including a thesis, strikes us as one of the most sensible ways to structure the honors curriculum. Students who do not choose to receive the University Honors Designation simply go straight to the Honors in Major track when they reach upper-division status. A typical first-semester freshman entrant should have an ACT/SAT of at least 29/1970, and rank in the top 10 percent (or equivalent) of her high school class. Second-semester freshmen may also apply if they rank in top 10 percent of their college; if students have a 3.4 college GPA but do not rank in the top 10 percent of their college, they may submit a personal essay and teacher recommendations to the honors advisor. Honors students may apply to live in Hubbard Hall, a co-ed hall that houses about 250 students in traditional rooms with corridor baths. Hubbard is not as close to some classes as other dorms, but it is still in a good location near Williamson and Christensen residence halls. All three are very convenient to Philbrook Dining Hall, one of the major dining locations on campus. Among the best academic programs at UNH are earth sciences, history, sociology, and English. The intellectual law program at the law school is one of the leading programs of its type in the nation. This entry was posted in Honors Curriculum, Honors News, Honors Residence Halls, Types of Honors Programs, Uncategorized and tagged extensive curriculum, honors housing New Hampshire, Hubbard Hall UNH, New Hampshire Honors College, UNH Honors College has clear by Honorsadmin. Bookmark the permalink.